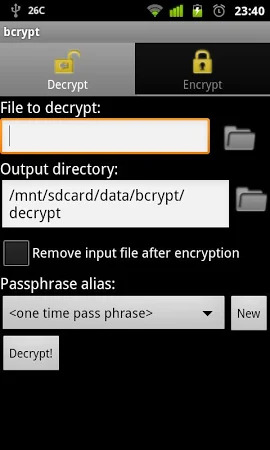 Bcrypt for Android. 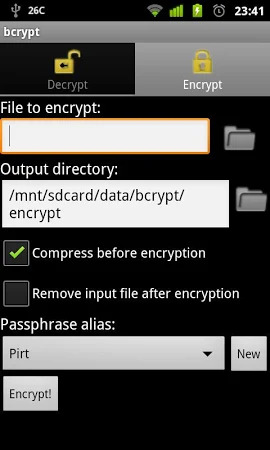 Bcrypt is a cross platform file encryption utility. Encrypted files are portable across all supported operating systems and processors, including. X86 (FreeBSD, OpenBSD, Linux, Cygwin, Win32). Sparc R220 (Solaris 2. 7, 2. 8). Sparc Ultra60 (Linux 2. 4). Alpha (Linux 2. 4). PPC G4 (MacOS X 10. 1 server). PPC RS/6000 (Linux 2. 4). MIPS (Linux 2. This application is completely safe for downloading. The app has been originally developed by WhoDunnit?Me! and it is related to the Tools category. Bcrypt has been rated 3.7 on Google Play. This application has been downloaded and installed by over 100 users and its most recent update is dated Feb 3, 2019. Get the installation package of bcrypt 20190103 that is absolutely free of charge and have a look at users' reviews on Droid Informer. The app runs flawlessly on Android 4.0 and above. It is the fastest and most advanced download manager available on android. Unit Converter and Currency Converter. Clean and simple interface. Convert Units. This is a keyboard that support typing in Sinhalese in English. This application enables you to export all your W.
This application does not root your device. A tool for medical physicists to quickly estimate CT patient dose. Want to see your exact handicap progress over time?